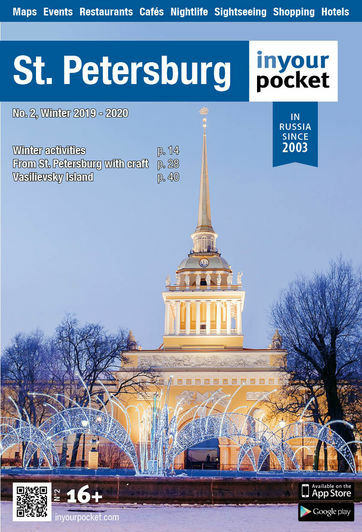 Most visitors make it to the Peter and Paul Fortress, the place where in 1703 Tsar Peter the Great laid the foundation of what would grow to become the St. Petersburg we know and love today. 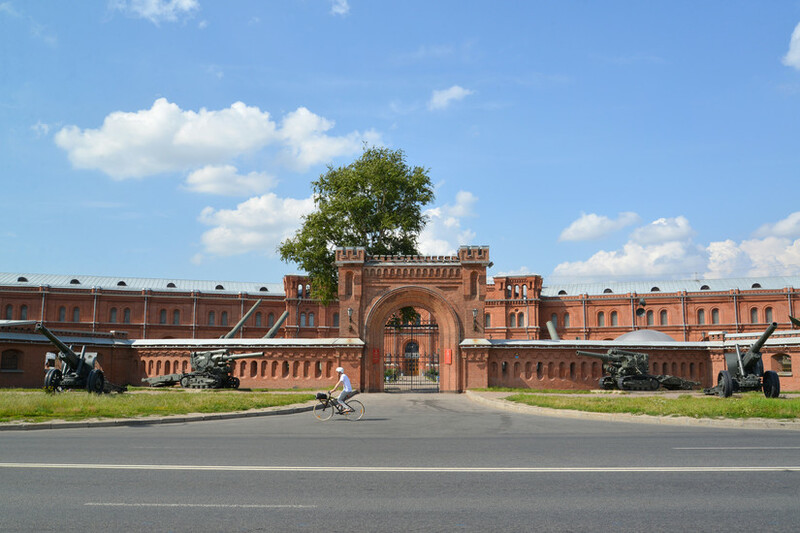 But what most visitors don’t know is that right behind the fortress is the Petrogradky District (or Petrodradskaya Storona, storona is Russian for “side”), an often overlooked and under-visited part of St. Petersburg. One of the earliest main avenues, dating from the 1730’s, is Bolshoy Prospekt, crossing the island from the northeast to Tuchkov Bridge in the southwest. 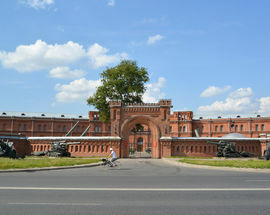 The Yamburgsky, Koporsky, St. Petersburg and Belozersky regiments had their quarters on the island at that time, and the new road served to connect them all. 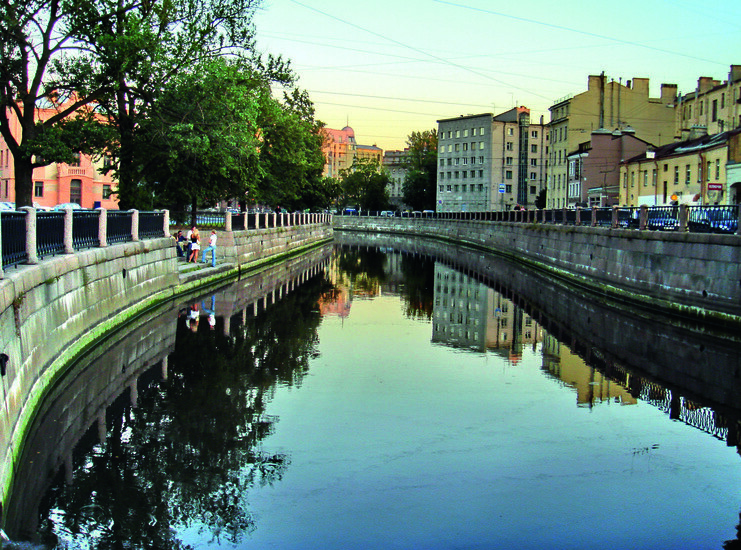 Bolshoy Prospekt is a swanky street that is kind of like the district’s very own 5th Avenue. If you stroll along you’ll find a lot of upscale and mid-range fashion, beauty and accessories brands like Max Mara, Pal Ziliere, Brooks Brothers, Marina Rinaldi, Karen Millen, Högl, Pandora, Yves Delorme, Bogner, Versace, Ralph Lauren Home, Emporio Armani, Lagerfel and many more. The other main avenue, the Kamennoostrovsky Prospekt intersects Bolshoy Prospekt in the north at Lva Tolstogo Square and runs southeast to the present-day Troitsky Bridge. The avenue was constructed in the 18th century, leading from the Kronverk esplanade to Kamenny Island. When St. Petersburg was renamed Petrograd in 1914, the island received its present name, Petrogradsky Island. Petrogradsky Island is the third largest island in the Neva River Delta delta. 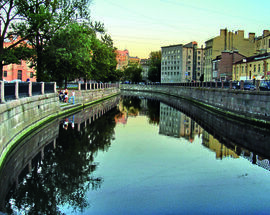 Along with Zayachy Island, Aptekarsky Island and Petrovsky Island, it constitutes the Petrogradskaya Side of St. Petersburg and hosts a number of universities and research centers, as well as cultural, historical and recreational facilities. It’s well worth a visit not only because of its historical and cultural value but also because it’s off the beaten touristic path so you can avoid the crowds and spend some quality one-on-one time with the city and its inhabitants. The district is very eclectic and boasts a wide range of architectural styles that reflect the many different periods in the city’s – and indeed the entire country’s – history. Expensive mansions stand side by side with museums of high culture, modern street art and legendary sub- and counter-culture spots making this part of town both stunning and paradoxical. If you’ve got comfortable walking shoes and about 3-4 hours to spare (depending on how fast you walk and how many selfies you usually take), we highly recommend following this non-touristy route we designed especially for you! To begin, you’ll want to make your way to Sportivnaya metro station. 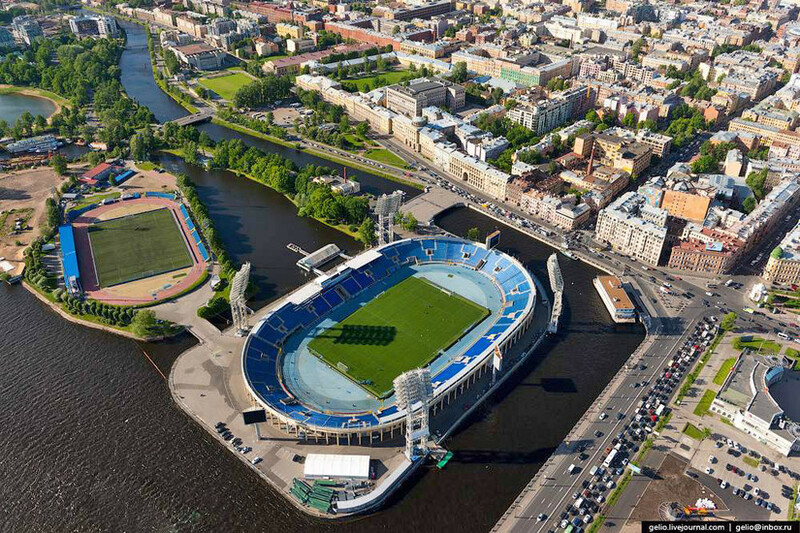 Take the Bolshoy Prospekt exit and when you emerge, to your left you’ll immediately be greeted by Petrovsky Stadium, which was once home to St. Petersburg’s legendary FC Zenit. To your right, you’ll see the pretty Uspensky Square with St. Vladimir’s Cathedral towering over it. The first wooden church built in 1708 on the site was dedicated to St. Nicholas. This church was replaced by a masonry church dedicated to the Assumption, completed in 1719. In 1740, a stone church was built next to the Cathedral of the Assumption by order of the Empress Anna. It was designed by Pietro Trezzini. The Late Baroque building was left incomplete when the Empress Elizabeth came to the throne in 1742. A new project was begun in 1763, this time supervised by Antonio Rinaldi, but that too was left incomplete following a fire in 1772. The side altar was dedicated to the Assumption in 1772, but the entire Neoclassical edifice was only completed to Ivan Starov’s designs in 1789 and dedicated to St. Vladimir. This church did not suffer the same fate as most churches did after the Bolshevik Revolution. Though the cathedral was closed in 1928, from 1938-1941, it served as the metropolitan cathedral of the city which was quite extraordinary at a time when the Communist government tried to eliminate religion. From 1941-2001, the Icon of Our Lady of Kazan was located in the cathedral before its transfer to the Kazan Cathedral on Nevsky Prospekt. in the history of Russian music. He is regarded as one of the pioneers of Russian rock and is credited with popularizing the genre throughout the Soviet Union and until this day retains a devoted following in many ex-Soviet countries. House 15 on Blokhina Street is the “Kamchatka” boiler room. 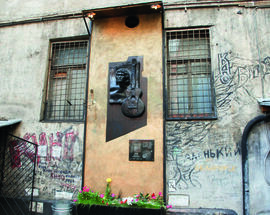 The boiler room, where Tsoi worked for three years in the mid 1980’s during the day and wrote his famous lyrics by night, is now the site of a museum and rock club dedicated to Tsoi. It is a place of pilgrimage for anyone – young or old – who consider themselves a Kino fan. The walls of the courtyard are spraypainted with words of love and devotion to Tsoi, a mural hangs over the entrance to the boiler room and there are always flowers laid by the entrance to honor this cult figure. Today, the boiler room serves as a museum/concert hall, that combines two epochs by preserving the personal belongings of Tsoi and giving young musicians a stage on which to perform. 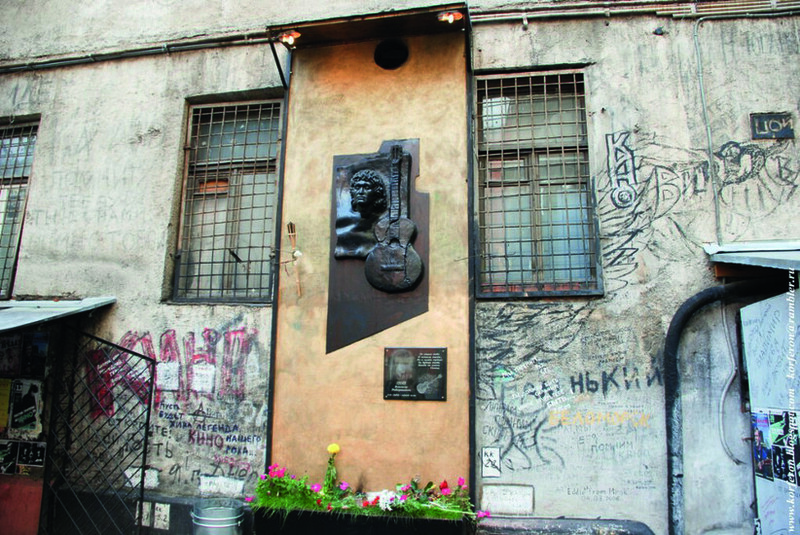 The square between house 17 and 15 is even named Viktor Tsoi Square. Continue for a few minutes down Blokhina Street until you find yourself on Kronverksky Prospekt and in front of Alexandrovsky Park. This leafy park, laidout in 1845, wraps in an arc around the Kronwerk moat and Artillery Museum. In the middle of the park, next to the Mini St. Petersburg, history buffs will certainly enjoy coming up close and personal with the monument to the Watch Guards, erected in memory of the events of the Russo-Japanese war. In fact, the entire park is dotted with all sorts of statues big and small, which makes for a fun little photo hunt. If you have kids in tow, the park harbors a few attractions worth considering, the best of which is the Planetarium, offering shows throughout the day, an observatory and several different display halls. The Leningrad Zoo, the Baltic House theater, the Music Hall and the architecturally stunning building of the old Orthopaedic Institute are also all here. Spend some time wandering around the park but don’t leave until you find Mini St. Petersburg – miniature sculptures of the city’s key landmarks. Launched in June 2011, the symbolic map of the historical center of St. Petersburg features bronze models of the city top 10 historical buildings (scale 1:30) and makes for a great photo opportunity. Strolling around is sure to make your feet a bit tired so we’d recommend taking a little break in the cozy cafe in the Granite cave with a viewing deck (the deck is open during the warmer months). The shape of the park resembles a crescent with a semicircular canal in the middle. 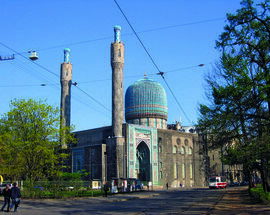 Kamennoostrovsky Prospekt runs through the park dividing it into two parts – with the smaller one next to a major Mosque of the city. After you’re done in the park, make your way towards the mosque. 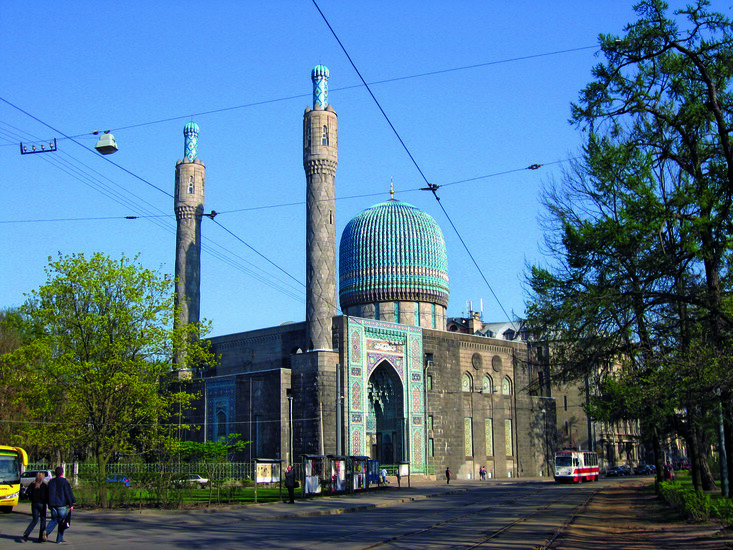 Against the background of St. Petersburg’s austere architecture, the oriental building crowned with a turquoise-blue cupola and accented by two elegant minarets stands out so you won’t miss it. The Mosque was founded shortly before World War I, in 1910, and was meant to commemorate the 25th anniversary of the rule of Abdul Ahat Khan, Emir of Bukhara (Turkistan). Next door is the State Museum of Political History of Russia. However, this mansion once belonged to the ballerina Mathilda Kschessinskaya. A prima ballerina assoluta at the Imperial Ballet (now the Mariinsky Theater), Kschessinskaya owed her renown and her considerable wealth not only to her unquestionable dancing talent, but also to her romantic affairs with three Grand Dukes of the Romanov family, including the future Tsar Nicholas II. This exemplary model of art nouveau - or more accurately northern style moderne - architecture was built 1904-1906 by Alexander von Hohen. The mansion thoroughly reflected not only the aesthetic fashions of the day, but also the personal tastes of Kschessinskaya. It consists of a series of connected structures of different dimensions that combine into an exquisitely asymmetrical whole. Following the Revolution, her beautiful mansion was seized by revolutionary soldiers and became the headquarters for the Central Committee of the Russian Social Democratic Workers’ Party (the Bolsheviks) and the editorial offices of party newspaper Pravda. On his return from exile in Finland, Vladimir Lenin also began to work in the house (as did Josef Stalin and Grigory Zinoviev), and the balcony facing Kronverksky Prospekt became the podium for some of his most famous speeches. Coincidentally (or not), baron Brandt, who is rumored to have been enamored with Kschessinskaya, ordered for his mansion to be built here in 1910. The designer was Robert Meltzer. Beautiful neoclassical wrought gates and a hanging lamp in the arch of the yard still decorate the mansion. In the dvorik (yard) you can see a mural depicting the victory of the Archangel Michael in a fi ght with the devil and high relief of marvelous beautiful girl inviting the weary traveler into the house. Wander a little deeper into the dvorik and you’ll get a view of the back of the colorful mosque. Then cross Kuibysheva Street and you will find yourself on Troitskaya (Trinity) Square, indeed an extremely important place in the history of the city. Although today it is a comparatively empty and unremarkable green space, 300 years ago, however, the square was a hive of activity. At the center of the square, Domenico Trezzini designed the wooden Troitsky (Trinity) Cathedral. For a long time, it was the main cathedral of St. Petersburg. Walking around you will undoubtedly see a 10-ton granite boulder. It is the Solovetsky stone taken 50 meters from the place of mass executions of the prisoners of the Solovki prison camp and is now officially known as the Memorial to the Victim of Political Repressions in Petrograd - Leningrad. Now you have two options: get back to the hustle and bustle of Petrogradsky District or take a little detour to see the Cabin of Peter the Great and even make it to the Cruiser Aurora. If you opt for the former, skip this paragraph and the next one. If you opt for the latter, walk a about 100 meters up the Petrovsky Embankment and on your left you will see the very first house to be built in Peter’s city! Hidden from wind and rain inside a red brick pavilion, the wooden house or cabin was intended for Tsar Peter himself. The cabin is very small - only 60 sq. meters in area and is a strange combination of a traditional Russian house - izba - and a Dutch home with large and elaborate windows and high roof, covered with wooden tiles. Tsar Peter lived in this house between 1703 and 1708 and the living room, bedroom and study, still filled with Peter’s original belongings, bear the mark of his presence till this day. Continue up the embankment and as the road bends left you will fi nd yourself face to face with the Aurora, a 1900 Russian protected cruiser, currently preserved as a museum ship. Aurora was one of three Pallada-class cruisers built in St. Petersburg for service in the Pacific. The cruiser played a key role in the Bolshevik Revolution: on the night of 25 October 1917, its crew fi red a blank round from the forward gun as a signal for the start of the assault on the Winter Palace. Now it’s time to explore Kamennoostrovsky Prospekt, the district’s main avenue! House number 1 is the Lidval House, a modernist architectural monument that was constructed in 1899-1904 by architect F.I. Lidval on land that belonged to his mother. It represents a new type of the apartment house with an open green yard - cour d’honneur, its arrangement improved the level of comfort and unified the street with the inner quarter areas. Picturesque asymmetry and the expressive shape of the buildings are emphasized with the variety of window shapes and the combination of natural stones (talcchlorite) and plaster of different textures. The facade’s design is distinguished with calligraphic finesse, masterful introduction of sculptural reliefs depicting birds, animals and conventionalised plant motives. 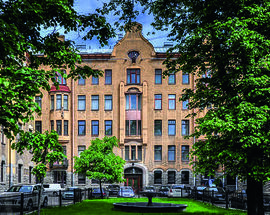 The House of Lidval is one of the first examples of the Northern Modern in St. Petersburg architecture. Lidval lived and worked there until 1918. Now this building serves as elite housing. Lucky residents! Next up is the legendary Lenfilm film studio. 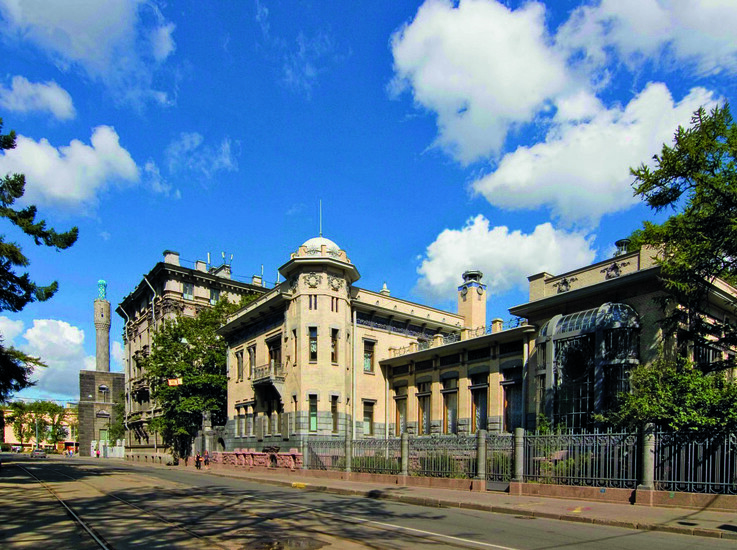 St. Petersburg was home to several Russian and French fi lm studios since the early 1900’s. In 1908 the St. Petersburg businessman Vladislav Karpinsky opened his fi lm factory “Ominum Film” which produced documentaries and feature films for local theaters. During the 1910’s, one of the most active private film studios was “Neptun” in St. Petersburg, where such figures as Vladimir Mayakovsky and Lily Brik made their first silent films, released in 1917 and 1918. The territory of Lenfilm was originally in the private ownership of the Aquarium garden, which belonged to the merchant Georgy Alexandrov, who operated a restaurant, a public garden and a theater on the same site. The composer Pyotr Tchaikovsky came to what was then the Aquarium Theater (and is now Stage # 4 of Lenfilm) as a guest to the 1893 performance of the overture to his “The Nutcracker” ballet. Famous Russian bass singer Feodor Chaliapin performed here in the 1910’s and the early 1920’s. Stars of the Soviet era also gave performances here, such as Isaak Dunaevsky and Leonid Utyosov with his jazz-band during the 1920’s and 1930’s. The facilities and land of the Leningrad film studio were nationalized in 1918 and it was established as a Soviet state-funded film industry. Since 1934 the studio has been named Lenfilm. By the end of the Soviet Union era, Lenfilm had produced about 1,500 films. Many film classics were produced at Lenfilm throughout its history and some of these were granted international awards at various film festivals. Lenfilm is a place that is tightly connected with world famous celebrities, such as Jane Fonda, Maximilian Schell, Marina Vlady, Julia Ormond, Michael Caine, William Hurt, Sophie Marceau, Sean Bean, Sandrine Bonnaire, Gérard Philipe and with many great Russians. Today, you can stroll freely throughout its halls, admire the original props and costumes from Soviet productions and Soviet-Western co-productions, have a drink and a snack at the café and, of course, attend film screenings. The studio has a lovely spacious garden so in the warmer months you can take your drink and snack and enjoy them in the sunshine. Your next stop on Kamennoostrovsky Prospekt is the Austrian Square (at the intersection of the Mira Street). The square came to life in the early 20th century, when the famous architect Vasily Schaub built four picturesque homes here. Surprisingly, the square remained nameless until 1992 when it was given the name Austrian because of the amazing similarity of its architectural style to the architecture of Vienna. Today, in addition to the official name, two more nicknames are in popular use. Locals called it “cheesecake” or “Star Square”, the latter owing to the octagonal shape of the square. House number 26-28 is the “House of Three Benoit”. 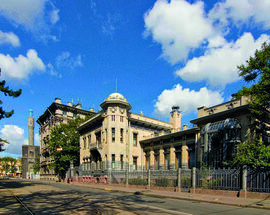 Neo-classical architects Leon Benois, C. J. Benoit, A. Benoit and A. Gunst carried out this project. This huge apartment complex was one of the most comfortable homes in pre-revolutionary St. Petersburg: in addition to sewer, water, steam heating, and telephones in the building, it even had its own power station, boiler room, laundry facilities, and incinerators. After the revolution some of the apartments became public, while others had party leaders (like Kirov) living there. Since 1999, the ground fl oor is home to a theater. If you have ever seen Russian movies or television series about the gangs of St. Petersburg of the wild 1990’s and the scene had a staircase with green walls and huge windows in the style of moderne, there’s a very high likelihood that it was filmed here. Go into the dvorik, wander around, get lost and feel as if you’re on a set of one of the gangster St. Petersburg movies and a wild chase through the narrow archways is just about to start. Also, here you will see loads of really bright and colorful street art so make sure to have your camera handy. After you get enough photos of this side of St.Petersburg, return to the main avenue and your next stop is the beautiful Andrey Petrov Square (i.e. the Violin Square). One of Leningrad’s most famous sons, Andrey Petrov was a Russian and Soviet composer, a People’s Artist of the USSR and the creator of the music for numerous beloved classic Soviet films such as “I Step Through Moscow” “Beware of the Car” and “Office Romance”. The yard is dotted with various sculptures of objects like high heel shoes and apples that somehow also feature a violin within them. There is also a little tree plantation and there’s a label attached to each tree with the name of the famous person who planted it. The biggest and most prominent tree was, of course, planted by Mr. Petrov himself before his death. Next door is the quirky little Deryabkin Private Museum of Phonographs and Gramophones. Some 100 meters further up is Lva Tolstogo Square and probably the most famous building in the entire Petrogradsky District. Popularly known as the “House with Towers”, its architecture is an utterly unique mixture of neoclassical and neogothic styles, with its two unmistakable hexagonal towers apparently based on the gatehouse of Maxstoke Castle in Warwickshire, England. The land plot was acquired in 1910 by Konstantin Rosenshtein, a Ukrainian-Jewish civil engineer, architect and factory director. The general design of the building was his, while the elaborate decorations were the work of the artist and architect Andrey Belogrud, whose passion for the Middle Ages (as well as the triangular layout of the plot) gave the building its highly distinctive exterior. Before the 1917 revolution, Belogrud himself lived in the highest apartment between the towers, and other residents included the writer Leonid Andreyev and opera singer Alexander Davydov. From 1921 to 1972, the first floor of the “House with Towers” housed a cinema, which then became the Leningrad Television Studio, which in turn was converted into a theater in 1985. Since 1996, it has been home to the Andrey Mironov Private Theater, which was the first official non-state theatre in the USSR. Right after the “House with Towers” is the Petrogradskaya metro station but don’t end your walking tour just yet! Keep walking up Kamennoostrovsky Prospekt and admiring the eclectic mix of constructivist and modernist architecture. 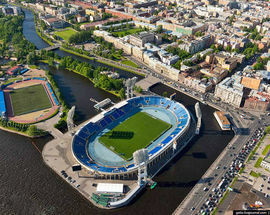 After just a few minutes you’ll hit Karpovka River and the Karpovskaya Embankment. Turn left before the bridge. You will likely see quite a few people lining up to a pie store. These pies are something quite legendary in this part of town so make sure to get one and snack on it as you walk to your penultimate stop on this architecturally, culturally and historically amazing walking tour. 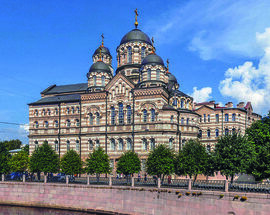 Just a minute or two up the picturesque embankment you will see the Convent of St. John of Rila, the largest convent in St. Petersburg and the only stauropegic monastery in the region. It was established on the bank of the Karpovka River by St. John of Kronstadt (1900) as a branch of the Sura Monastery of St. John the Baptist. The main pentacupolar church of the Twelve Apostles (1902) was built to a Neo-Byzantine design by Nikolay Nikonov. 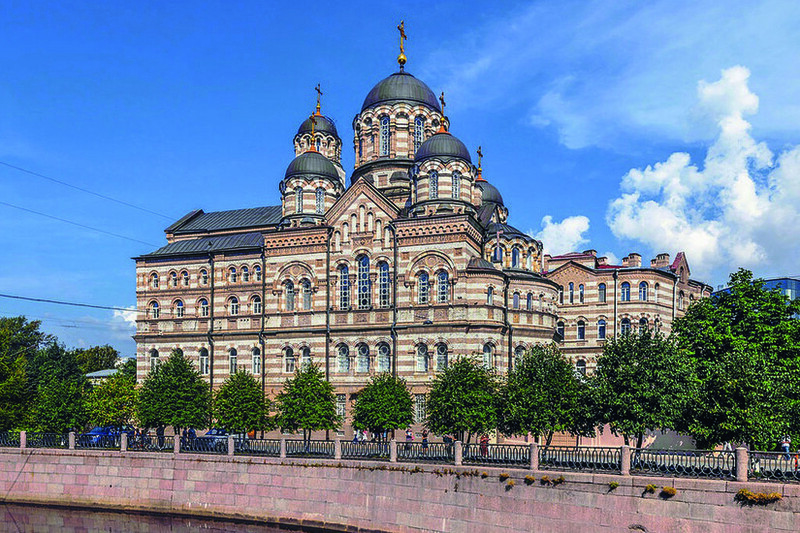 The ground floor contains the marble tomb of St. John of Kronstadt. The convent was disbanded by the Soviets in 1923 but was reopened as a branch of the Pühtitsa Convent in 1991. For your final stop, you’ll need to make your way back to Kamennoostrovsky Prospekt. Opera buffs, this one is definitely for you. House number 26 on Graftio Street is the Feodor Chaliapin House-Museum. Acclaimed by Arturo Toscanini as the greatest talent with whom he ever worked, Feodor Chaliapin was a self-taught singer of peasant origin who took first Russia and then the whole operatic world by storm with his powerful voice, technical brilliance and raw charisma. 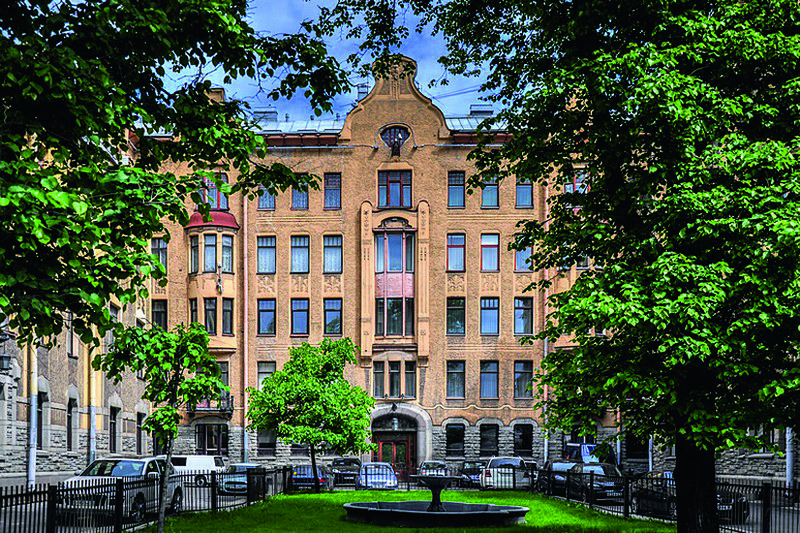 Although Chaliapin left the Soviet Union for good in 1922, he never officially argued with the Bolshevik government, and this apartment on Aptekarsky Island, his home in St. Petersburg since 1914, was preserved along with its contents by his secretary. The Chaliapin House Museum was officially opened to the public in 1975 and underwent a total revamp in the 1990’s.